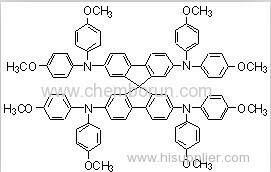 2,2',7,7'-Tetrakis[N,N-di(4-methoxyphenyl)amino]-9,9'-spirobifluorene is designated for processing from solution to be used as Hole Transport Material (HTM) for Organic and hybrid solar cells. Interface engineering of highly efficient perovskite solar cells, Huanping Zhou et al., Science, V 34, p.546 (2014). Sequential deposition as a route to high-performance perovskite-sensitized solar cells, Julian Burschka et al., Nature, V499 p.316 (2013). Nanostructured TiO2 /CH3NH3PbI3 heterojunction solar cells employing spiro-OMeTAD/Co-complex as hole-transporting material, Jun Hong Noh et al., J. Mater. Chem. A, 1, 11842-11847, DOI: 10.1039/C3TA12681A (2013).